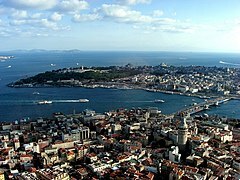 Istanbul (Turkish spelling: İstanbul) is the biggest city in Turkey. Until 1930s this city was known in the West also by the name Constantinople; some writings named it Stambul, especially in the 19th century. In Classical Antiquity, it was known as Byzantium or Byzantion. Agatha Christie's room at the Pera Palas Hotel. Cimitero ottomano / Ottoman cemetery. Tomba ottomana in un cortile privato / Ottoman grave in a courtyard. This page was last edited on 9 February 2019, at 12:03.